All Posts Tagged With: "Body Cleansers"
Marta is absolutely in love with the NEW Caress Whipped Souffle Ultra Silkening Body Wash blackberry cream. 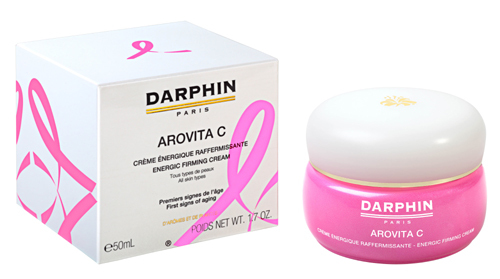 It smells divine, it’s super creamy and very moisturizing. I even us this new Caress body wash as a shaving cream because it’s so silky and creamy. WATCH: Marta Walsh is all about the NEW Caress Whipped Souffle Ultra Silkening Body Wash. 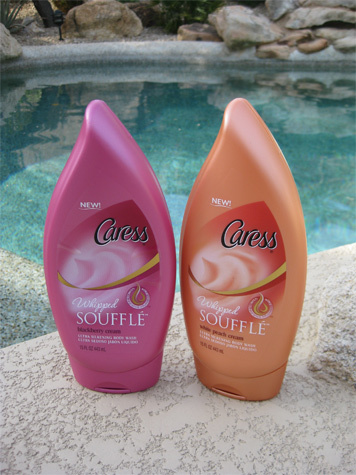 I also love the Caress Whipped Souffle Ultra Silkening Body Wash white peach cream and the NEW Caress Velvet Bliss Silkening Body Wash, Blackberry & Vanilla Essence. All launched this week (week of March 22nd, 2010). NEW from Dial: NutriSkin Body Wash Cherry Seed Oil & Mint and NutriSkin Body Wash Grapeseed Oil & Lemongrass. How delicious these two scents sound? Can’t wait to try. I’m a true body wash lover. Probably one of my biggest beauty obsessions. Dial NutriSkin Body Wash features a clean-rinsing formula that’s heavy on moisture and light on skin. It’s packed with nutritious fruit oils that leave skin soft and revitalized, not greasy or grimy. Best Body Wash: Tried and loved NIVEA Touch of Sparkle Cream Oil body wash, $6.49. The calla scent is amazing and the diamond powder leaves skin soft and shimmering (and you know how much Marta loves shimmer!). I also love NIVEA Touch of Radiance Cream Oil body wash for days I like to exfoliate my body. This one has a light lime blossom scent which is super fresh. Men also love it this body wash! Visit www.nivea.com for addtional details. philosophy Classic Cookbook ($35) is a set of six delicious, high-foaming, multipurpose cleansers. This decadent ensemble of three-in-one Shampoo, Shower Gel & Bubble Bath formulas will make you swoon with scents of the decadent treats that come from the crinkled pages of well-loved holiday baking recipe books. This set contains: 6 x 2.0 oz Shampoo, Shower Gel & Bubble Baths in Pumpkin Spice Muffin, Red Velvet Cake, Double Rich Hot Cocoa, Warm Pear Cobbler, Gingerbread, Cinnamon Buns. This season, give your loved ones the gift of soft, moisturized skin (Marta is all about it:) with St. Ives. Looking for stocking stuffer or last-minute gift? Have you thought about a vintage inspired gift that can be found in the aisle of any local drugstore? For a limited time this holiday season, Yardley of London is offering a Limited Edition Gift set in two time-tested fragrances: Oatmeal & Almond and English Lavender. 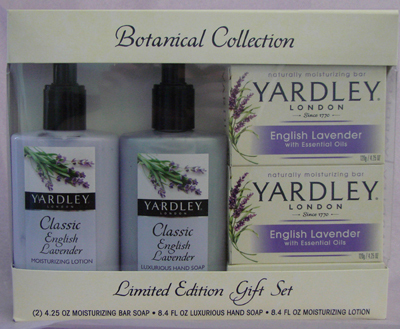 Yardley of London’s Botanical Soap Collection Limited Edition Gift Set – $9.99 – Includes two moisturizing bar soaps, one luxurious hand soap and one moisturizing lotion. Available exclusively at Walgreens Drugstores nationwide. 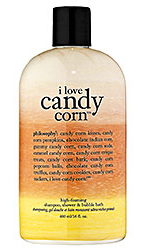 Nothing says fall, Halloween, and holiday season like I Love Candy Corn Shampoo, Shower Gel & Bubble Bath by Philosophy, $16. It smells sweet. And, it’s very creamy, just like all the other signature body washes by Philosophy. If you love Philosophy body washes in Crème Brulée and in Vanilla Birthday Cake you would love this! It’s a limited edition so don’t miss it if you want it:) Calling all candy corn lovers!